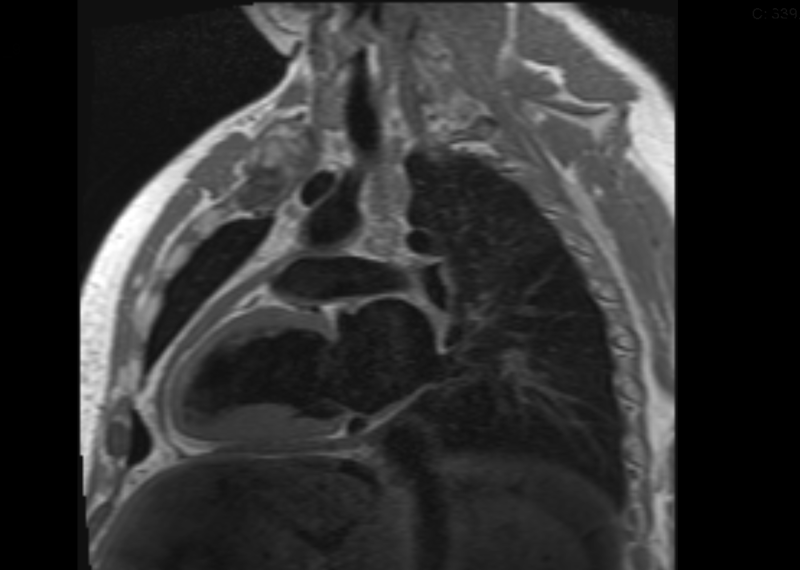 Case Presentation: A 39 year old male with a history of congenital bicuspid aortic valve and ascending aortic aneurysm repair (1 year prior) presented with recurrent bilateral lower extremity edema (LEE). He first presented with LEE 3 months post-surgery. Transthoracic echocardiogram (TTE) initially showed mild apical and inferior hypokinesis with a mildly dilated left atrium and ventricle, but a normal left ventricular ejection fraction (LVEF). He was diagnosed with diastolic heart failure. Despite medication compliance, he had recurrent symptoms. 3 weeks prior to the current presentation, he again noted bilateral LEE, abdominal swelling and dyspnea on exertion. His exam was notable for clear lungs, prominent jugular venous distention, a distended abdomen with ascites, and 2+ pitting LEE extending to his sacrum. His chest x-ray was unremarkable. A repeat TTE again showed a normal LVEF, but noted a new echogenic collection within the pericardial space. Findings also included echocardiographic pulsus paradoxus, expiratory exaggeration of hepatic vein flow reversal, and equalization of the left and right ventricular pressures during diastole (“square root sign” (SRS). Cardiac MRI (Figure 1) revealed thickened pericardium with diastolic septal bounce towards the apex. These findings were suggestive of constrictive pericarditis (CP). A left and right heart catheterization confirmed equalization of right and left heart diastolic pressures with a SRS again noted on pressure tracings. He underwent pericardiectomy with significant improvement and maintenance of euvolemia at post-operative follow-up. Discussion: In our case, CP was due to pericardial manipulation during aortic aneurysm repair. Common etiologies of CP are cardiac surgery, radiation therapy or idiopathic pericarditis. The incidence of CP post-cardiac surgery remains low (<2.5%). CP results from chronic inflammation leading to scarring and fibrosis of the pericardium. These changes lead to decreased pericardial compliance and impaired diastolic function. CP presents with recurrent systemic venous congestion without pulmonary involvement. NSAIDs and steroids can be effective early treatment, but CP is rare and can be initially overlooked. Although TTE and cardiac MRI are often enough to establish the diagnosis, cardiac catheterization is helpful in distinguishing CP from mixed constrictive-restrictive entities. Pericardiectomy is the treatment of choice in patients with CP, resulting in marked improvement in NYHA class and cardiac filling pressures. One-third of patients may develop recurrent symptoms. All-cause, 30-day mortality ranges from 5% to 10% and at 10 years, 20%. Conclusions: Constrictive pericarditis is a rare reversible cause of recurrent heart failure symptoms, but should be suspected in patient with a prior cardiac surgery history and primarily right-sided volume overload signs and symptoms. Shah MR, Gala P, Lee MSL. Constrictive Pericarditis: A Rare Cause of Potentially Reversible Heart Failure. Abstract published at Hospital Medicine 2016, March 6-9, San Diego, Calif. Abstract 510. Journal of Hospital Medicine. 2016; 11 (suppl 1). https://www.shmabstracts.com/abstract/constrictive-pericarditis-a-rare-cause-of-potentially-reversible-heart-failure/. Accessed April 25, 2019.